Sohini is a night raga that allures listeners into its swift and sweeping phrases, often conveying emotions of sringaar, longing, and sensuousness. Sohini belongs to Marwa Thaat, and has a scale bearing very close resemblance to both Marwa and Puriya. Its aroha is as follows: S G (shuddha) Me (tivra) D (shuddha) N (shuddha). The avaroha proceeds to include komal Re as follows: S N (shuddha) D (shuddha) M (tivra) G (shuddha) R (komal) S. Its jati is therefore audav-shadav. Given that it shares the same swaras as its sister ragas of Marwa and Puriya, how does Sohini differ? Firstly, it is an Uttarang Pradhan raga – a raga that is developed primarily in the higher range of the octave. The chalan, or movement, of the raga, as with many Uttarang Pradhan ragas, is paced faster and flightier. Its focal notes are Dha (vadi swarwa) and Ga (samavadi swara), another feature that sets it apart from the other ragas in the family. The emphasis on these notes results in some of the key phrases of Sohini’s development: G M D N S R S(taar), N D M G; S R S R N S N S (taar) N D N, D; N D M G, G M D M G, M G R S.
Being that Sohini is a slightly more chanchal raga, it is not sung in the vilambit context. Most bandishes in Sohini are in the madhya-laya and drut tempose, including many taranas and lighter pieces such as dadras. 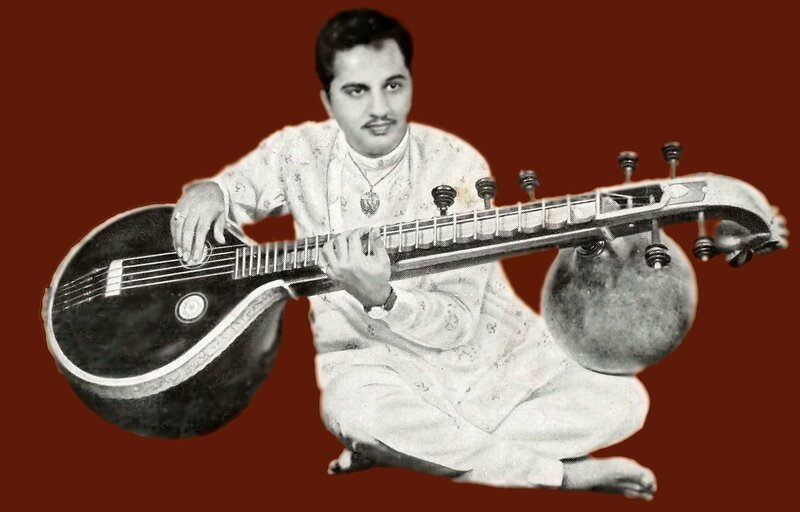 In the traditional repertoire, we have Panidt Vishnu Narayan Bhatkhande’s bandish, “Guru Charan sharan Kar Manuja,” in teen taal, a bhakti ras composition that describes the devotion and gratitude towards the guru. There is also “Jaanu mein Sab Tumhari,” in Jhap taal, and the drut bandish “Dekh Bekh Man Lalchaye,” Ustad Faiyaz Khan’s “Chalo Hato Jaao More Saiyyan” is a dadra that utilizes the full emotive quality of this raga. Kumar gandharva’s bandish “ Rang na daro Shyamji” is also famous amongst listeners. In the Carnatic system, the raga counterpart for Sohini is called Hamsanandi. It is performed often and has been used by many of the hailed composers of the tradition in their kritis. 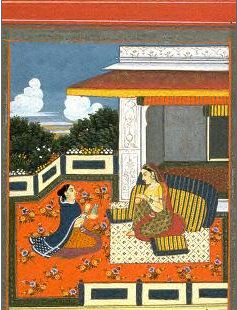 A janya of the 53rd melakarta Gamanasrama, this is a panchamavarjiya raga — the raga does not have the note Pa. This is why the raga has to be handled very carefully, as accidental touching of Pa, however briefly, will bring in the shades of Poorvikalyani, another important raga in Carnatic music, which also happens to be a janya of Gamanasrama. As the note Pa, in whichever raga it appears, is an ‘anchor’ note like mantra Sa and Tara Sa and acts as a nyasa swara it is a stabilizing factor. Hence, the absence of Pa calls for a little alertness in handling this raga. This raga resembles raga Sohoni of Hindustani music, which is a janya of Marwa tthat. Hamsanandi is a Shadava Shadava raga as it has six notes both in arohana and avarohana. The swaras are Shudha Rishabham, Antara Gandharam, Prati Madhyamam, Chatushruti Dhaivatam and Kakali Nishadham. A very pleasant raga, Hamsanandi is very suitable for light music, and bhajans Compositions for dance also sound very attractive in this raga. As there are not many heavy compositions in this raga, the scope for using it as a main raga in a Carnatic concert is limited. The prayogas G M D G M G and G M D N S N D M G are very attractive and establish the identity of the raga instantly. Other compositions in the raga are Pahi jagatjanani of Swati Tirunal in Aadi tala, Needu Mahima of Muthiah Bhagavatar also in Aadi and the Tamil composition of Papanasam Sivan Srinivasa in Aadi. There is another type of Hamsanandi said to be a janya of 8th Melakarta Hanumathodi, which is not very popular and rather unfamiliar. It is not heard of much. Describing the dance of Lord Sankara in the Chitra sabha of Chidambaram, the composer describes the congregation of devas and Rishi munis witnessing the cosmic dance of Lord Siva who is adorned with garland of skulls, smeared with bhasma (holy ash) dancing away with Bhootaganas. The song uses syllables used in Bharata natya i.e. TA, TATAKKITA, TAKKA etc. Rag Hamsanandi is the janya ragam of 53rd Melakartha Gamanasrama and it is evening raga . In carnatic music there are only few compositions so not much of scope for listeners. The few are Needu Mahima – Muthiah Bagavathar, Tirupathi Venkataramana- Purandara dasar, Pavana Guru-Lalitha dasar, Srinivasa Thiruvengadamudayan-Papanasam Sivan. In cinema, there are lot of compositions (apart from Kalaiyum Neeye) and all of them are very popular. A raga that instantly sets off a meditative and intense mood when handled is Hamsanandi. This raga is easy to identify even for an untrained listener since it’s notes are so peculiarly aligned and its prayogas specially crafted. A fairly new raga, it is best sung in a breezy style, highlighting its frills, while paying due attention to the feeling conveyed by its plain notes. Hamsanandi takes on sadja, suddha rishabha, antara gandhara, prati madhyama, chatusruti dhaivata, and kakali nishada. The pancama is eschewed and this chasm in the centre of the raga gives rise to the emotion of yearning and fervent appeal. A symmetric one in ascent and descent, Hamsanandi is a shadava raga (having six notes). Swati Tirunal’s “Pahi Jagajanani” is a well-known kriti in this raga. “Needu Mahima Pogada” of Muthiah Bhagavatar, “Srinivasa” of Papanasam Sivan, and “Pavanaguru” of Lalitadasar are other interesting compositions in Hamsanandi popular on the concert platform. Sunadavinodhini is an allied raga of Hamsanandi, the difference being that the rishabha is absent in Sunadavinodini, all other notes remaining the same. “Devadi Deva” of Mysore Vasudevachar is popular in Sunadavinodini. In film music this scale has been used rather selectively but with great impact. “Thesulavuthe” from “Manalane Mangayin Bagyam” starts off majestically in Hamsanandi and then moves on to another scale in the second charanam. A plethora of sangati-s in the pallavi at “Nenjame kaadal” set our pulse racing with Ghantasala’s smooth vocals. The Hindi version of this song “Kuhu kuhu bole koyaliya” from the film “Suvarna Sundari”, sung by Lata Mangeshkar and Rafi, is charming in its own way, the free-wheeling sangati-s and bols in “Saj sringaar rutu…” taking our breath away. This Adi Narayana Rao creation will always be a favourite of music connoisseurs. “Ezhumalai irukka”, sung boldly by K. B. Sundarambal in the film “Thirumalai Deivam” under the music direction of Kunnakudi Vaidhyanathan, is an example of how this raga can be adapted to the silver screen, using its inherent poignancy to maximise the devotional appeal. Many people think “Kaalaiyum neeye” of A. M.Raja from “Thaen Nilavu” is in Hamsanandi. It may be replete with lovely Hamsanandi-like phrases but is not strictly based on the raga itself. The viruttam “Enna koduppaan” from “Karnan”, with music by M.S.Viswanathan – Ramamurthy, is based in Hamsanandi and establishes the stamp of the raga within seconds. Starting in the top sadja and anchoring itself at the nishada, this little piece has a huge recall value. “Vedam anuvilum oru” from “Salangai Oli” is a masterpiece of Ilayaraja sung brilliantly by SPB. In the lines “Sangeeta nattiyame” the phrase “g, m, d, ns,” is clearly established. The complex sangatis leave us gobsmacked, and one wonders in awe as to how a single raga can convey so many emotions in so many ways. In the film “Mella Thirandadu Kadhavu”, the classical piece “Pavanaguru” was sung by Chitra and used simply, sans frills. It was a clever exercise in establishing the raga’s prescence in an unadulterated fashionon the silver screen. In the film “Payanangal Mudivadillai”, the song “Raga deepam” is an evergreen classic in this raga. The opening phrase “s,n n,d d,m m,g / g m d n s” bears the Hamsanandi stamp and brings forth the traditional flavour of the raga. Once again a creation of Ilayaraja, sung by SPB, this one will always be here to stay. This rAga can be derived from gamanashrama (mela 53) by removing pa from the scale entirely. If you further remove rishabam from both ArOhaNam and avarOhanam, you get sunAdavinOdini. I liked all the A M Raja’s song so Kalaiyum Neeye Malaium Neeye attracted me for its strong base , karvai etc. Through that song I got attracted to raga Hamsanandi. I followed this raga with similar songs in Hindustani – it is called rag Sohini. Hamsanandi is the janya ragam of 53rd Melakartha Gamanasrama and it is evening raga . The southern state of Karnataka, in India, has a distinct art and culture. The diverse linguistic and religious ethnicity that are native to state of Karnataka combined with their long histories have contributed immensely to the varied cultural heritage of the state. Apart from Kannadigas, Karnataka is home to Tuluvas, Kodavas and Konkanis who also consider themselves as Kannadigas. Minor populations of Tibetan Buddhists and Siddhi tribes plus a few other ethnic groups also live in Karnataka. The traditional folk arts cover the entire gamut of music, dance, drama, storytelling by itinerant troupes, etc. Yakshagana, a classical folk play, is one of the major theatrical forms of coastal Karnataka. Contemporary theatre culture in Karnataka is one of the most vibrant in India with organizations like Ninasam, Ranga Shankara and Rangayana active on foundations laid down by the Gubbi Veeranna Nataka Company. Veeragase, Kamsale and Dollu Kunitha are popular dance forms. Bharatanatya also enjoys wide patronage in Karnataka. Karnataka is the only south Indian state(dravidian state)where both Hindustani and Carnatic singers flourish. North Karnataka is predominantly famous for Hindustani music and South Karnataka is well known for Carnatic music. With the rise of Vaishnavism and the Haridasa movement came Karnataka composers like Purandaradasa, whose Kannada language works were lucid, devotional and philosophical and hence appealing to the masses. Other haridasas of medieval times were Kanakadasa, Vyasatirtha, Jayatirtha, Sripadaraya, Vadirajatirtha etc., who composed several devara nama. One of the earliest and prominent composers in South India was the saint, and wandering bard of yore Purandara Dasa. Though historians claim Purandara Dasa composed 75,000 – 475,000 songs in Sanskrit and Kannada, only a few hundred of them are known today. He was a source of inspiration to the later composers like Tyagaraja. Owing to his contribution to the Carnatic Music he is referred to as the Father of Carnatic Music (Karnataka Sangeeta Pitamaha) Purandaradasa codified and consolidated the teaching of Carnatic music by evolving several steps like sarali, jantai, thattu varisai, alankara and geetham and laid down a framework for imparting formal training in this art form. Later in the 17th and 18th centuries, the haridasa movement would once again contribute to music in Karnataka in the form of haridasas such as Vijaya Dasa, Gopaladasa, Jagannathadasa who are just a few among a vast galaxy of devotional saints. Karnataka has achieved a prominent place in the world of Hindustani music as well. Several of Karnataka’s Hindustani musicians have bagged the Kalidas Sanman, Padma Bhushan and Padma Vibhushan awards. Some famous performers are Gangubai Hangal, Puttaraj Gawai, Pt. Bhimsen Joshi, Pt. Mallikarjun Mansur, Basavaraj Rajguru, Sawai Gandharva and Kumar Gandharva. Yakshagana a form of dance drama is one of the major theatrical forms in coastal Karnataka. A fusion of folk and classical tradition makes Yakshagana a unique form of art which includes colourfull costumes, music, dance, singing, and most importantly dialogs composed on the fly. Award winning performers include Shambhu Hegde, Chittani Ramachandra Hegde. Yakshagana and Dollu Kunitha are two of the popular dance forms of Karnataka. Gamaka is a unique music form based on Karnakata Sangeetha.